Whither non-violence? Or Wither non-violence? While in Bhubaneshwar, I was curious to go and see the 'Shanti Stupa', a memorial to commemorate Emperor Ashok's 'change of heart' after witnessing the carnage of the Kalinga Battle. The visit was eminently disappointing, to say the least. The Kalinga battle has been taught to every Indian child in history classes and portrayed as an event that shaped Indian culture and its ethos of non-violence. Ashok himself has been immortalized by his 'Chakra' on our flag and his Lion capital being our national emblem. Given the importance of this event and Ashok's contribution to India, I expected a lot from this monument. The reality turned out to be quite different. 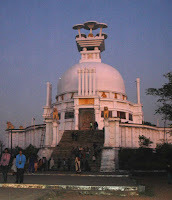 A stark white stupa stands atop a small hillock at Dhauli, about 20 km. from Bhubaneshwar. It has four statues of Buddha, each in a different pose on the sides. 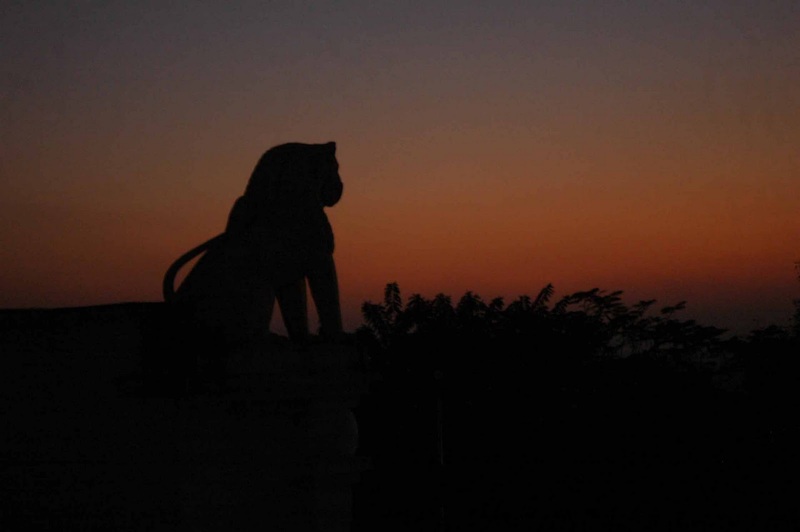 Eight lions stand watching outward, towards the vast plains that witnessed the grim battle of Kalinga. That's it. There is not a single plaque, not a word written anywhere in the premises stating the importance of this place. I later found out that the stupa was actually built by the Japanese Kalinga Nipppon Buddha Sangh as recently as 1971. Steps leading up to the stupa are flanked by the usual shops selling odd assortment of objects, the kind of shops that one sees outside any Indian temple. The place appears to be a popular picnic spot for people. While returning I couldn't hold on to my disappointment and feigning enough ignorance, I asked the taxi driver whether this place had any significance or whether the stupa was built here 'just like that'. He said he didn't know. Then as an afterthought, he said "you know Ashok, the King? It has some connection with him". Some saving grace, at least.